Athlete's foot, also known as tinea pedis, is a common foot infection caused by fungi called dermatophytes. Found in many different places indoors and outdoors, dermatophytes are especially common in the warm, moist environments of pools, showers, locker rooms and other sports facilities, where people walk with bare feet. Once dermatophytes contaminate the skin of a foot, the warm, moist environment of sweaty socks and shoes encourages them to grow. 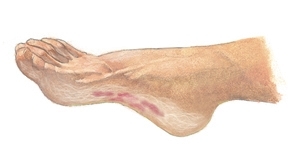 In most people, signs of infection are seen on the webbed skin between the toes. In some people, the infection spreads to one or more toenails, causing the nail to appear unusually thick and cloudy yellow.